The title of this book is a misnomer. Superman dies between the first and second issues. Those first 2 issues are best read as part of the Death of Superman collections. In the wake of fighting Doomsday, the team has been decimated. Wonder Woman comes in to lead the team and recruits a bunch of B level superheroes to fill the ranks. The Destiny's Hand story line is the best in the book. Dr. Destiny has created an alternate world where the JLA of a few years ago have taken over the world and murder criminals. Then we find out the deal behind Bloodwynd and it is as dumb as how he spells his name. There's also an annual that is part of the Eclipso: The Darkness Within that ran through all the DC annuals one year. It takes place sometime during volume 1 though as Guy is still a Green Lantern. A daft name for the collection, really - as the cover suggests, within two issues Kal is dead. Let's not get into the many sins of that story here, but note only that it also messes up the rest of the League pretty much as set-dressing, leaving Blue Beetle comatose and Booster Gold's costume - the source of his powers - in shreds. A problem to which, even considering he's often played as a bit dim, he takes a remarkably long time figuring out the solution. And not only does poor Fire lose her powers too, but it doesn't even happen in her own book, meaning that as you read this collection they basically vanish between issues! So that means Jurgens and the rotating cast of art finishers have to do the 'recruiting a new team' story, which goes about as well as you'd expect, including the obligatory character nobody's ever heard of (Agent Liberty?) who proceeds not to do much for a couple of issues, then vanish with as little explanation as Fire's powers. Even speaking as a fan of Aztek, that's a poor showing, mate. And then it's on to the 'dark alternate future' story which reads like an amateurish foreshadowing of Injustice, to the extent that I wonder if that game or comic's creators read this at a formative age. Weirdly, this also features Doctor Destiny, as seen in the early issues of Gaiman's Sandman, which it explicitly references - yet another nail in the coffin of any notion that the DC and Vertigo universes were ever separate, an oddly widespread belief despite such other giveaways as Darkseid and J'onn at Morpheus' funeral. 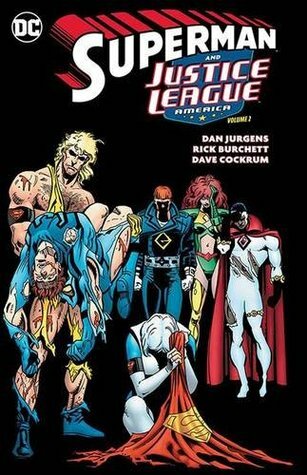 Speaking of which, the collection - and Jurgens' run - wrap up with the resolution of the mystery surrounding enigmatic League member Bloodwynd. A resolution which is promptly bungled in exactly the same way Xorn later would be in X-Men, despite this version all occurring on one writer's watch. A right bloody mess, then. With one odd exception. The first thing in the collection is an annual tying in to a long-forgotten crossover starring Eclipso, who I've always found more a Macguffin for hero-versus-hero fights than a character. It's not even written by Jurgens, only plotted, with some guy of whom I've never heard doing the script. And yet it's really good fun! Part of this is down to the Dave Cockrum art, not least when Wonder Woman is not impressed with someone, which is fairly frequent. But even beyond that, Mishkin's dialogue captures the feel of Giffen & deMatteis much better than Jurgens manages, especially in the scenes following Beetle as he singlehandedly tries to evade and stymie a much more powerful foe in the League's base. Things start off strong but the mix of characters gets progressively less interesting as the page count climbs. You can keep your Black Condor, thank you; I would gladly have a little more Ted Kord and Clark Kent. via NYPL - Firstly, the title is slightly misleading, as Superman dies after the second chapter and is hardly in the book (although his death casts a long shadow over two subsequent chapters). As for the stories, the Eclipso Annual is solid enough, but as part of that years's Annuals crossover storyline, don't expect any real resolution. The Doomsday brawl is solid action, but the aftermath stumbles badly. The greater arc, the JLA roster overhauled as members are unable to continue after being battered by Doomsday, is a nice idea, but the dialogue, flat emotional beats, and clumsy introduction of new members leave the entire mini-arc lifeless. Fortunately, Jurgens bounces back with a very satisfying and dark Dr. Destiny-featured thriller. The volume-concluding two-parter that reveals J'Onn/Bloodwynd's secrets is pretty much run-of-the-mill mediocre superhero stuff. These are fine JL stories from the era that inaugurated me into comics. The Justice League faces Eclipso, loses Superman to Doomsday, and launches a recruitment drive before landing in Doctor Destiny's alternate reality. The book closes with a classically complicated revelation of Bloodwynd's true identity. Dan Jurgens is a master storyteller, and the artwork is slick house style. Public library copy. Considering the in and out roster line up of the team, Jurgens' long run was good and he told great stories. I was surprised because the book was better than expected. Segundo y último tomo de la League de Jurgens. Publicado años antes en castellano en dos tomos. Apart from the first chapter dealing with the aftermath of the death of Superman, this was a pretty mediocre collection of stories that don't really say anything interesting. Love when Hawkman has his servants cut off Sinestro's arms and then when he escapes, he kills him with a yellow sword made from the yellow ring he stole from Sinestro.